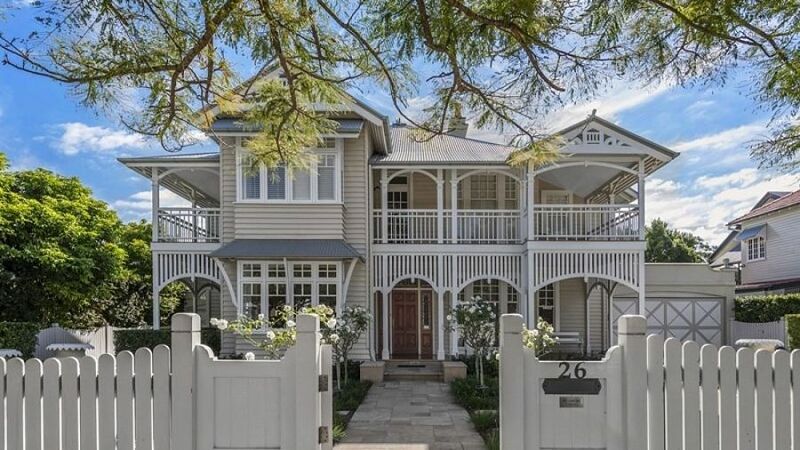 The house dubbed “Brisbane’s most beautiful Queenslander” has been snapped up after only weeks on the market in a secret deal worth millions. Owned by Dr John Fenwick, a radiologist, and his interior designer wife Christin Fenwick, the sale of 26 Mayfield Street, Ascot remains shrouded in secrecy – agent Matt Lancashire of Ray White New Farm confirmed the gorgeous seven-bedroom, five-bathroom home was under contract but refused to speculate on who to, or how much for, saying the new owner wanted to remain private. Listed for sale by expressions of interest in the range of $7.5 million to $8.5 million, it’s possible the house is now one of the most expensive residential sales ever made in Ascot. It would need to have sold for more than $8.3 million to eclipse 24 Palm Avenue, Ascot, which records show sold off-market in February to local couple Anthony and Dana White. Ascot’s record sale last year was made in September when one of Australia’s richest female CEOs, Maxine Horne, and her Fone Zone co-founder and husband David McMahon, sold their stunning Hamptons-style Ascot estate at Sutherland Avenue. Purchased by Dominos Pizza head Don Meij for $8,615,000, it was Brisbane’s second-highest residential sale of 2016. But it was in 2014 and 2015 when Ascot’s top two residential sales were brokered – another Sutherland Avenue house, owned by pub baron Andrew Griffiths, sold to local couple Christopher and Linda Miers for $10.2 million – and then in 2015 a house at Sykes Street sold for $10.4 million. Ascot has long been one of Brisbane’s most exclusive blue chip suburbs, boasting a plethora of multi million-dollar estates and sprawling Queenslander homes favoured by the city’s wealthiest residents. Yet it can’t lay claim to Brisbane’s most expensive property – that mantle goes to the cliff top mansion at Leopard Street, Kangaroo Point, which sold for a staggering $18.48 million in March, making headlines around the nation. The sale of 1 Leopard Street smashed the previously held Brisbane record of $14 million, made when Australia’s richest person Gina Rinehart bought a home in Aaron Avenue, Hawthorne, in late 2014.